It’s a fact: two out of three initial applications for Social Security disability benefits are denied by the Social Security Administration (SSA). Put another way, the majority of people who apply for benefits get a rejection letter in the mail. Why Do So Many People Get Rejected for Benefits? 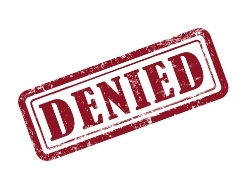 It’s important to understand that being rejected doesn’t mean that you aren’t disabled and unable to work—it just means that you did not convince the SSA of this fact. The SSA wants to make sure that you are disabled. With a huge backlog of cases and concerns about funding, the SSA wants to make absolutely sure that the people it awards benefits to cannot work and need financial assistance. If the agency has any doubt that you suffer from a long-term disability or that you are unable to continue to work, then it will deny your application. Your application does not prove you are disabled under SSA guidelines. A huge number of people who apply for disability benefits do not complete the process accurately or thoroughly. While they may be disabled and unable to work, they may neglect to prove those two facts with hard evidence in their application. Others might forget important paperwork or run into other red tape. The SSA absolutely won’t approve a claim that doesn’t fit its parameters or that isn’t thorough or complete. You don’t cooperate with the SSA. During the claims process, you may be asked by the SSA to provide further medical records or to go to a doctor for a consultative examination. If you don’t comply with the agency’s requests for more information, then your claim could be denied even if you are disabled. You earn too much money. Social Security disability is meant for those who cannot participate in gainful employment because of a health condition. Although you can continue to have a small income while receiving benefits, you are not allowed to make over a certain amount. If you make more than the specified amount, then your claim will be denied. Your disability doesn’t prevent you from working. One of the biggest misconceptions about Social Security disability benefits is that if you have a certain health condition, you automatically get payments. This is absolutely not the case. Unless your disability prevents you from being gainfully employed – and you can prove it in your application ­–your disability claim will be denied. Social Security disability fraud does exist. Unfortunately, there are people in this country who attempt to secure Social Security disability benefits even though they are not too disabled to work. Because of this small population of residents who are attempting disability fraud, the SSA must be watchful for people who do not provide solid evidence of their medical condition or their work limitations. Despite these potential obstacles, it is possible to get the Social Security disability benefits that you deserve if you understand the process and how to protect your rights. How Is a Denial Decided? together to determine whether you are disabled or not. The disability examiner works on your file. The state agency medical consultant is a doctor or psychologist who reviews your statements and medical records and make determinations about the severity of your impairments, any functional limitations associated with these conditions, and whether you are credible or not—all without ever examining you! Any statement that you make about your daily activities could be relevant to your claim and may be used to determine if you can work. Most of the time, this evidence is picked apart, disassembled, and reassembled to paint a picture of you that is not wholly accurate. You want to make sure your statements and medical evidence are interpreted accurately and fairly. That is why it is important to obtain legal representation when you first apply for benefits. If your initial Social Security disability claim has been denied, don’t lose hope—you are in the majority. Take action now by filing an appeal with the help of our experienced Social Security disability lawyers. Call us today at 877-898-1581 to schedule an appointment.